Apologies for my blogging absence to those who might have noticed ( hi mom, hi Jon Silverman), I was in Ecuador. Personally, I wouldn’t use the phrase “I am afraid of heights.” It’s not the height that causes me fear. My office is on the 21st floor, and I’m not scared. I am afraid of falling, more acutely falling and getting hurt. I would, in general, prefer not to get hurt; would prefer all my faculties intact. I may not be an athletic person but I am an active person and having an injury would really slow my roll. That seems reasonable to me. Doesn’t it seem reasonable to you? 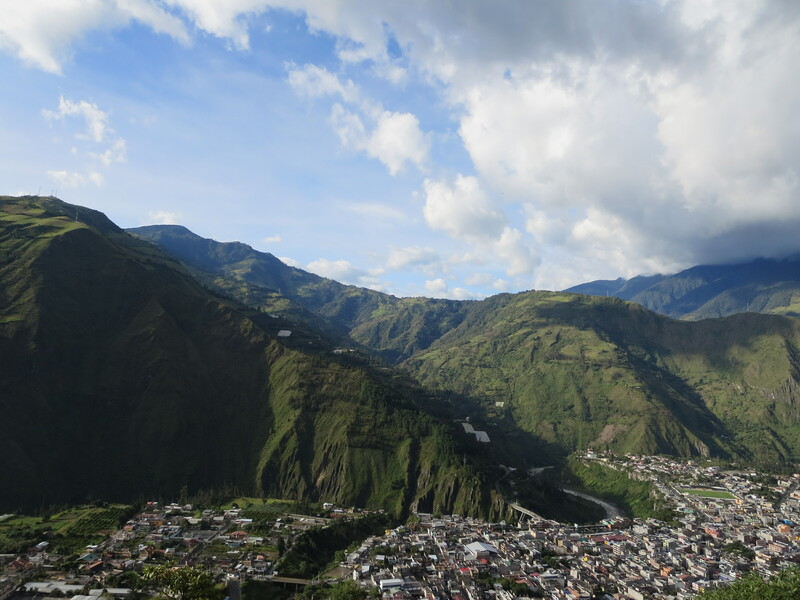 Well, I found myself in the adventure capital of Ecuador: Banos. Located where the Andes open up to the Amazon, Banos is lush and green and hilly. 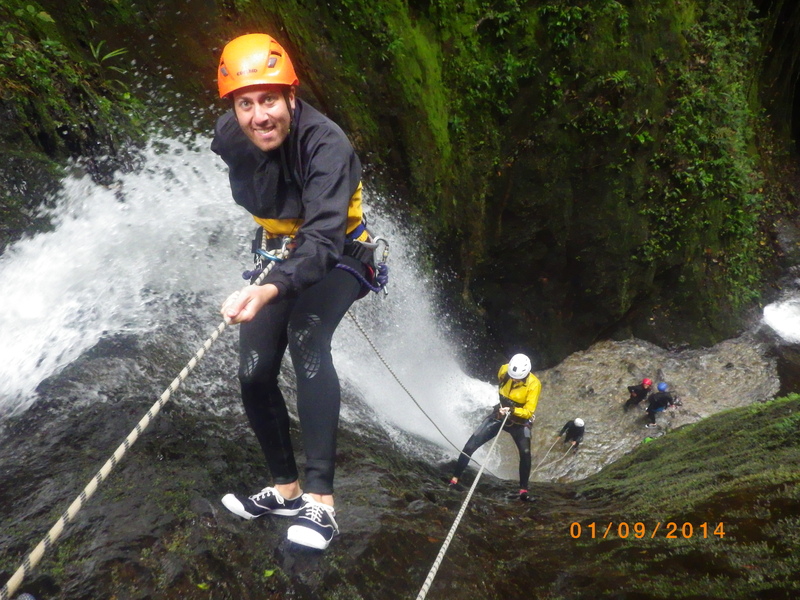 Banos is sackful of adrenaline junkie style activities at developing world prices (and, I feared, safety protocol). Since I famously can’t ride a bike, downhill mountain biking was out. (For those interested you get driven in van to the top of a volcano and you single track bike your way down. Oy gevalt). They also offer bungee jumping, rafting, hiking and ziplining at few tiny travel spots unavoidable on a walk through the town. Matt and I had our eyes set on canyoning. My friend had done it a few years ago in Banos and loved it. 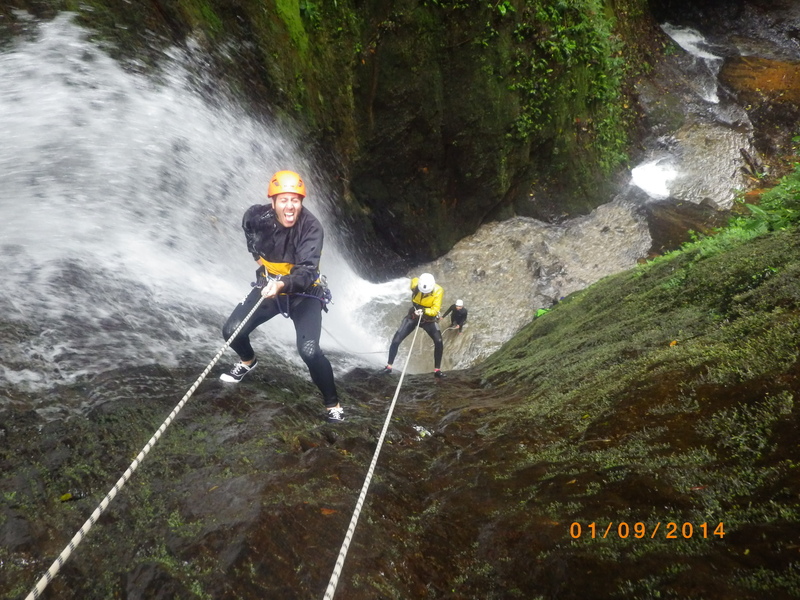 In my own special Nicole way, I agreed to canyoning without ever processing what canyoning IS. So let me tell you: You hike up the side of a steep mountain. To get back down you rappel down fast pumping waterfalls. As in: you jump or climb backwards down a slippery mountainside with water avalanche-ing into your legs, vision, soul, all other parts. We arrived at MTS Adventure (totally recommend!) 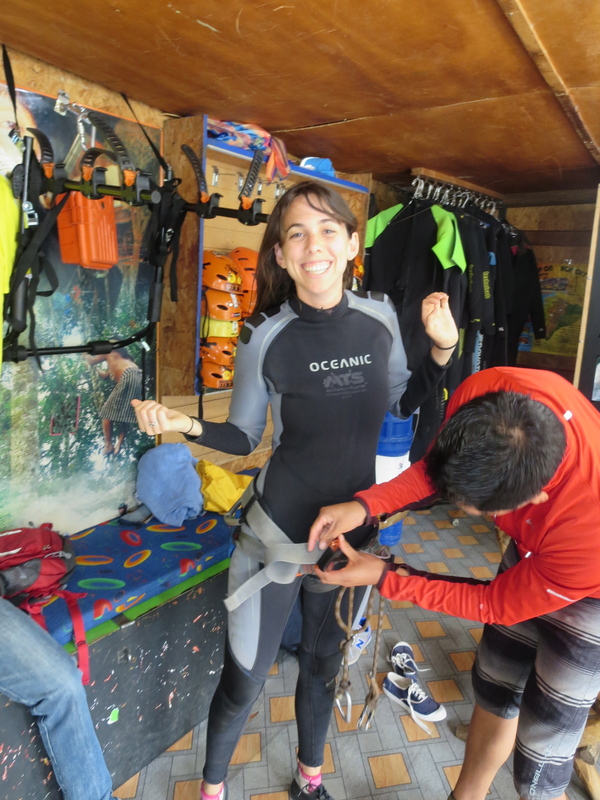 and they fit us in wetsuits, harnesses, waterproof jackets, shoes, and helmets. 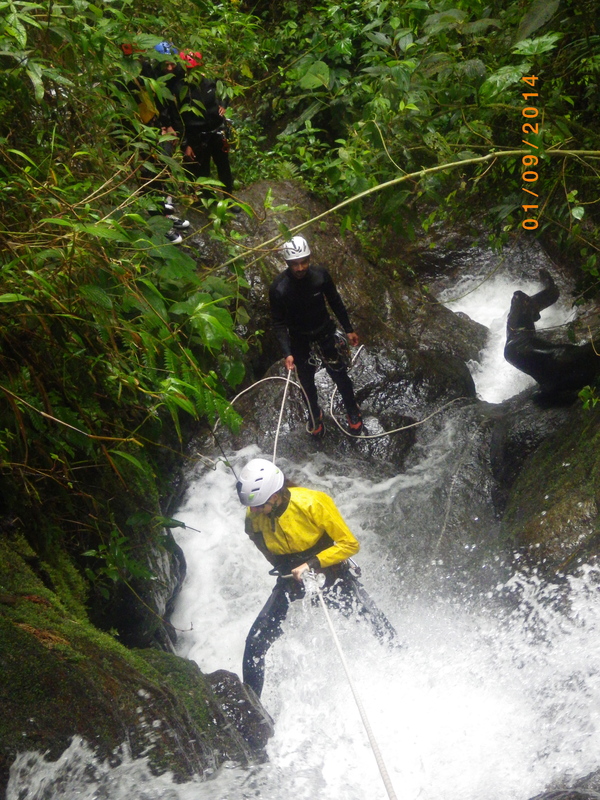 Then Alberto, the canyoning trainer, demonstrated how to move down the waterfall and how to clip in and out of the rocks. The demonstration was on flat ground, so if you can imagine, Alberto explaining en Spanglish “Just squat and walk” then you too have received the lesson. That was the guidance we received. I saw a ~25ft climbing wall behind Alberto and said, could I try this on that, instead? He said sure, and somehow I summoned the courage to climb the ladder. I got to the top and Alberto said “just fall off it” I had a clear response ready: NO. So Matt went first, and rappelled down the climbing wall. Then, since he remained alive, I went. Something came over me. My fear evaporated. I just GOT IT. It was like I stopped being Nicole and was dusted with Spidey-sense. I rocked my way down the wall. We were ready for the big time! We hopped in the car and drove to the waterfalls. We hiked up a mountain wearing our helmets and harnesses. Then came time to “fall back” down the face of the waterfall. And so we did. And it was awesome. I can’t explain why I wasn’t scared, or why I loved it when climbing the wall scared me. Growth? 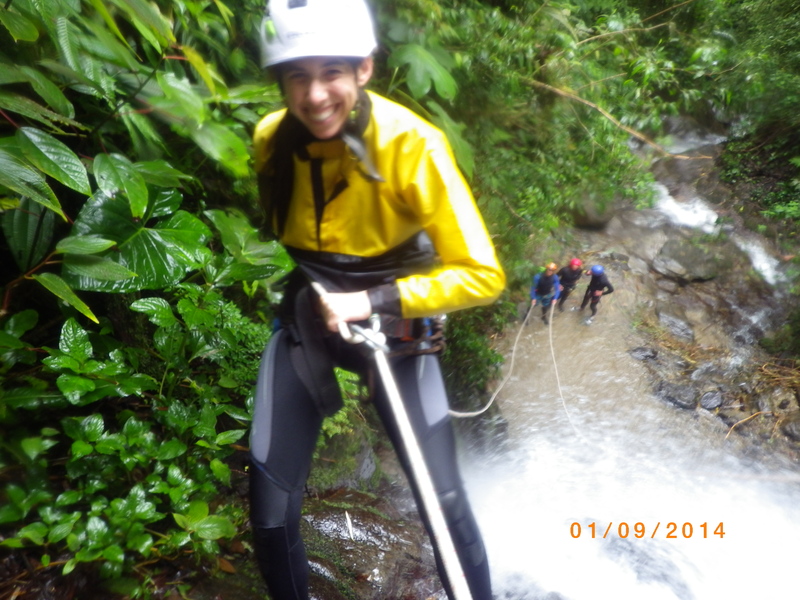 I loved canyoning.